CHAMPAIGN, Ill. — Illinois alumnus and philanthropist Larry Gies will serve as the campuswide commencement speaker Saturday, May 11. The ceremony takes place at 9:30 a.m. at Memorial Stadium. 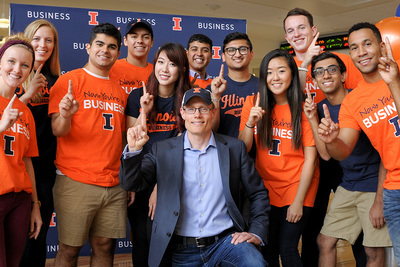 Gies holds a bachelor’s degree in accountancy from Illinois and has returned to give a guest lecture in the business college in each of the past 25 years. He and his wife, Beth, made history in 2017 by giving $150 million, the largest gift in Illinois history, to the leading business school now known as the Gies College of Business. Gies says he gave the gift because he is on a mission to democratize education. A native of Mendota, Illinois, Gies said he never considered another college. He said the people he met on campus shaped his life. Tickets for commencement are now available. Information regarding convocation, reception, regalia and other details is at commencement.illinois.edu.